Hmm.. I'm not so sure! I chose her image called "flip flop trio". and the paper I was going to use. in similar colours to the backing paper. added a simple (freebie) sentiment form desert divas. Vicky - Striped paper is a great choice for this Flip Flop Trio! It enhances the patterns within the image. Super summery card! A really summery card. I love te Flip Flops and the bright stripy paper is a great addition. Thanks for sharing with us at Crafty Cardmakers. Sally.x. Oh, this is so cute! I just love how you colored my image and the colors are so great for summer. Fun and bright. Hopefully it brings some Summer weather for you! Thanks for joining us at Crafty Cardmakers. 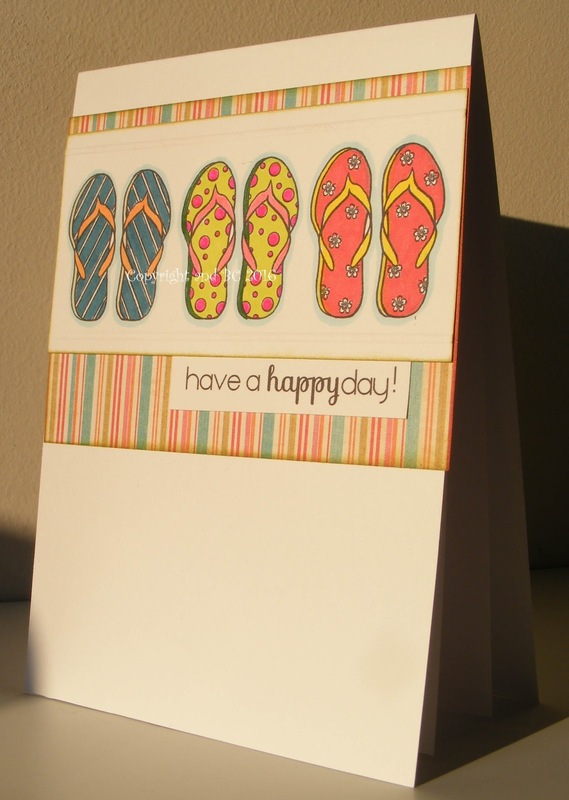 A lovely summery card! Thank you so much for joining us at Crafting By Designs. Good Luck!